Located on the historic Cowgate Street, we are right in the heart of Edinburgh's party and cultural district. Between Holyrood house (the seat of the Scottish parliament) and Edinburgh Castle. 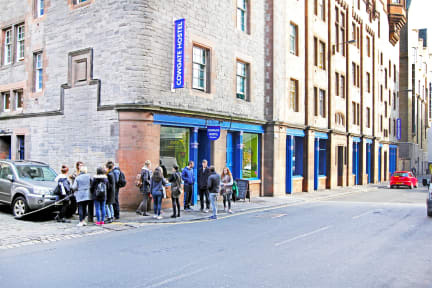 The Cowgate Tourist Hostel gives you the freedom to explore the cities vibrant nightlife, or relax and enjoy a peaceful afternoon wandering through Edinburgh's many museums, art gallerys and public parks. * Check-out is 10:00am (you are welcome to store your luggage at reception). * Any cancellations MUST be made ON THE DAY BEFORE your arrival or you may be charged for the night. A HOSTEL WITH A DIFFERENCE! Our 170 bed hostel contains 12 individually lockable apartments all fully fitted with there own toilet, shower rooms and fully equipped kitchens. An apartment sleeps between 8 and 22 people in a combination of 4 and 6 bed dorms and twin or double rooms. GROUP HEAVEN: Our unique layout allows us to offer private apartment hire to larger groups ensuring privacy for you and your friends. Due to the fact that we can provide separate facilities we are happy to offer group accommodation to Stag and Hen parties. Conditions apply. Located right in the city center. If was q uite cold inside though.